Plenty of people fear the dark. But there’s a particular anxiety felt among white people walking alone in the dark in black neighborhoods. 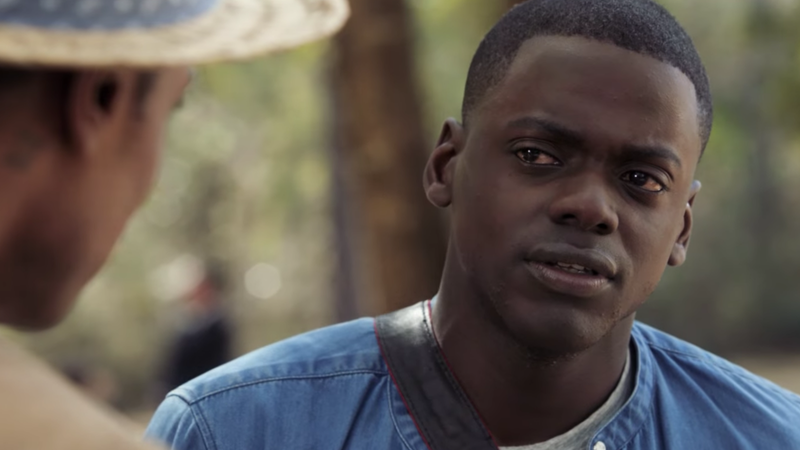 Get Out opens with a similar sense of dread, but from a black man’s perspective. The character, Andre (Atlanta’s Lakeith Stanfield), is lost in the suburbs at night. He’s aware something bad could happen and of course something does. He’s scared in their space, more than they ever could be in his, because their space happens to be everywhere. White fascination with blackness has always coexisted with fear and Get Out expands on that truth. The most terrifying nightmare, it projects, is simply reality. This is Jordan Peele’s first directed feature, a slow-dripped revenge thriller about the disturbingly quiet nature of racism that twists the horror genre into a brutal surrealist display. The film presents white people as supreme psychological terrorists, and it’s framed through the view of an interracial relationship. Once the protagonist Chris Washington (Daniel Kaluuya) arrives with his girlfriend Rose Armitage (Allison Williams) to meet her family (who allegedly don’t know that he’s black), it doesn’t take long for him to notice that something’s off. Devious, complicit white people exists all around him, plotting against his existence in plain sight, while he’s stuck in a cycle of paranoia, compelled to seek comfort in the few black people around. They’re not all there, so to speak. Chris learns that the black people in town are merely vessels for evil who’ve been taken and driven into a state of madness (in the movie, this theater of the mind is called The Sunken Place), and he doesn’t want to become one of them. His one ally there is Rose, whose apparent cluelessness dissolves in a grotesque way. That is the literal plot, a living metaphor. Horror is the perfect, glaringly obvious medium for racial politics. Peele can use it to both explore and escape the heaviness, to lighten the tragedy of real life and dress it in shock. The symbolism, the visual language, is overt by design. Chris feels trapped, like an other, and we see it over and over, in the way he observes and glares in response to his environment. It’s in the way white people obsess over his identity, dropping Obama references, complimenting his physicality and wanting to be him. Their choice to turn their savagery into normalcy puts him in danger, but he doesn’t fall for their tricks, instead questioning the nature of reality for the sake of survival. It’s an instinct, much like Andre’s at the top of the film. While the concept of white people as body-snatchers is enough to work within itself, Peele’s imaginative narrative drives the subject even deeper. There’s brainwashing, hypnotism and sociological deception. The real horror, exemplified many times over, is the weapon of white privilege and pretense. The horror is in how they move both secretly and openly. Two particularly intense scenes involve Chris being seen as what they fear—in one, he’s put in a chokehold that looks like he’s being hanged, and it’s a startling subversion of Hollywood’s construction of the black monster. Some of the most visceral scenes involve another archetype: Georgina, the black maid; it’s in her that Chris notices the most pain and tries to piece together the mystery. White terror and the tragedy of black fear, as a daily reality, isn’t often visualized like this, and the desire for such a story in Hollywood makes it easy to automatically champion despite flaws. Audiences pushed the movie to $30.5 million in its opening weekend. Peele shows good intuition with material that could’ve come off heavy-handed and lets the story tell itself, which more than just the interracial relationship, is about the collision of black bodies with white people’s propensity to be predators. Working within the horror genre can be limiting, so the movie adheres to tropes (don’t go in there, etc. ), but there’s also necessary humor (Chris’s best friend Rod, played by Lil Rel Howery, serves a critical detective role as a TSA agent/incredulous black friend). Peele smartly weaves in the idea of white obsession with blackness as a source of their terror, drawing psychology into the narrative, too, and presenting desire as a sense of lack. They want to be something they fear and they terrorize in pursuit of it. This is the white monster at work. The result is impressive, especially after Peele’s prior film with Keegan-Michael Key, Keanu, which labored so much in trite racial stereotypes. It’s weird that the same person was involved in both projects. Here, as director and writer, he gets to reclaim the horror narrative, where black characters are often peripheral casualties, and flip it into cinematic commentary that’s predictable in the same way that evil is. It’s enjoyable nonetheless. The layers are endless and once you realize the totality of what’s happening, the events take on new meaning. The white people on screen fail to recognize their sins. The same white audience that propelled the sketch show Key and Peele are the characters in the movie. The white people in the theater are watching themselves, and perhaps there’s a weird catharsis in seeing the exorcism of their own guilt. Do they get it? Do they realize that after the credits, they’ll revert to the same reality they just witnessed? Peele chose interracial relationships as his framework, but a number of scenarios could’ve worked in its place. Recently, a friend and I shopped at the Whole Foods that opened last summer in Williamsburg. Walking around, we joked about feeling out of place among all the whites. There were so many of them and they had taken over that space. The horror to us was the state of oblivion they were free to wear. We talked about how gentrification can upend the idea of community and make people feel like strangers in the world. A week later, I saw Get Out in downtown Brooklyn, among a mixed crowd, and noticed how seldom I’d been in a theater that was cheering specifically at white people paying for their sins. An elder black woman sat next to me with her popcorn, providing DVD commentary along the way. Occasionally, she would turn to me with questions, in disbelief. She kept repeating them in the dark. “What the heezy?” “Why’d he go in there?” “What is this?” “What are we watching?” she asked. Maybe she hadn’t seen the trailer, or maybe she wasn’t quite prepared for how real it could get.